Bonavista Town Council is proposing to change its Municipal Plan and Development Regulations to rezone approximately 2 hectares of land on the south side of Red Cove from “Open Space” to “Open Space Tourism” to allow Council to consider a proposed hotel development. The amendment also corrects a previous mapping error by inserting a zone boundary between the Open Space zone and Rural zone in the vicinity of Cape Shore Road. Council invites public comments on the proposed change. 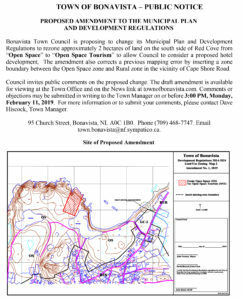 The draft amendment is available for viewing at the Town Office and on the News link at townofbonavista.com. Comments or objections may be submitted in writing to the Town Manager on or before 3:00 PM, Monday, February 11, 2019. For more information or to submit your comments, please contact Dave Hiscock, Town Manager.